The churches are too numerous to even begin to show here. 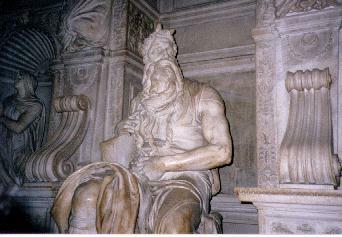 Michaelangelo's Moses is so magnificient that it needs to be shown. Located in St. Peter in Chains, this wonderful work is breathtaking. The little twin churches in the photo above are interesting because they exist. Look-alikes on the exterior, they are quite different inside. 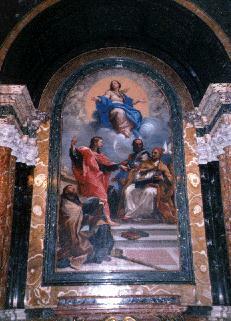 The painting is just one example of so many great works of art in the churches. Lots of photos, be patient. Click on the photo to view, then use your browser's "BACK" button to return here.